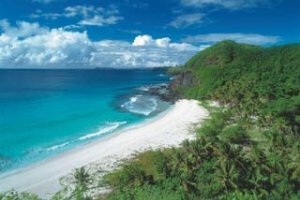 The Yasawa islands are ideally positioned about 50 kilometers north west of Nadi. This narrow archipelago consists of 4 main islands (Waya, Naviti, Nacula and Yasawa) as well as numerous smaller islands that stretch in a north easterly direction. The islands were formed by volcanoes millions of years ago and therefore have mountain peaks across the islands. A number of years ago the Fijian government lifted their restriction on tourism for the Yasawa island chain and since then a number of budget and luxury resorts have sprung up, catering to a variety of holiday travellers. When staying at any of the resorts on Yasawa Islands guests can either admire the abundance of natural beauty including white sandy beaches, clear blue waters and the Sawa-i-Lau caves or make the most of the many activities that are available including snorkelling, fishing, scuba diving and even horseback riding. The easiest way to get to any of the Yasawa Islands is via the fast 200 passenger catamaran called the 'Yasawa Flyer'. This boat departs from Port Denarau every morning at 9am and returns at 6pm and stops at all of the resorts of the following islands, Kuata, Wayasewa, Waya, Drawaqa, Naviti, Yaqeta, Matacawalevu, Nanuya Lailai, Tavewa and Nacula. You can also charter private seaplane transfers to any of the Yasawa island resorts. You can click here to see all Yasawa Island Rates & Availability. The Safe Landing Resort on Nacula Island is ideally located close to Yasawa and provides a remote tropical holiday destination for all sorts of travellers. Guests staying at this Yasawa resort will marvel at the picturesque water views and green hills that surround the resort. The accommodation at the Safe Landing Resort is comfortable, features all of the things that you need to a relaxing holiday and also includes three meals a day. There is an entertainment area, bar and restaurant serving fresh seafood and organic fruit and vegetables. When you stay at the Safe Landing Resort you will find that there are lots of things to do including snorkelling, cave tours, fishing, island picnics, scuba diving and even a relaxing massage. If you want hotel and/or resort accommodation on Yasawa Island at cheap rates for your next holiday then Holidays Fiji is the place for you. We give holiday travellers the ability to compare a range of hotels, resorts and apartments at the same time, thus making it easier for you to decide where it is that you want to stay. So book your accommodation at any of the Yasawa Island resorts with confidence, and even take advantage of the cheaper rates for longer stays.